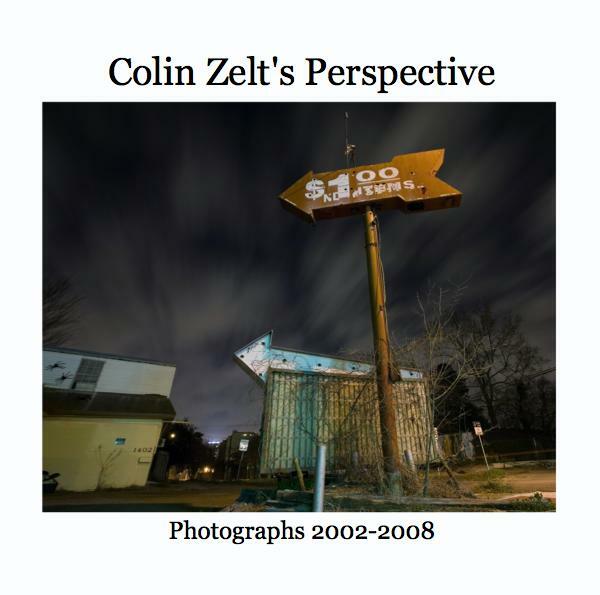 Colin Zelt's Perspective. This 12x12 book contains over 250 photos from all of my bodies of work up to 2008. It is a new and improved edtion of the book listed below. Colin Zelt's Perspective. This 11x13 book contains over 200 photos from the first ten bodies of work listed below. It is an earlier version of the book listed above. An 8x10 version of this book that includes the same photos is available here. The Sea-Arama Ruins. This book contains all 56 photos in this body of work. Rocky's Neighborhood at Night. This book contains 78 photos from this body of work. Texas Junk Company. Over 130 color photos in this series on the Texas Junk Company in Houston, Texas. All images are copyright Colin Zelt and may not be reproduced in any form without permission.